The art of invigorating and prolonging life, by food, clothes, air, exercise, wine, sleep, &c and peptic precepts, pointing out agreeable and effectual methods to prevent and relieve indigestion, and to regulate and strengthen the action of the stomach and bowels: to which is added, the pleasure of making a will, by William Kitchiner; 1822; Hurst, Robinson, and Co., London. A comprehensive look at all the tricks in the trade in securing a longer and fuller life. 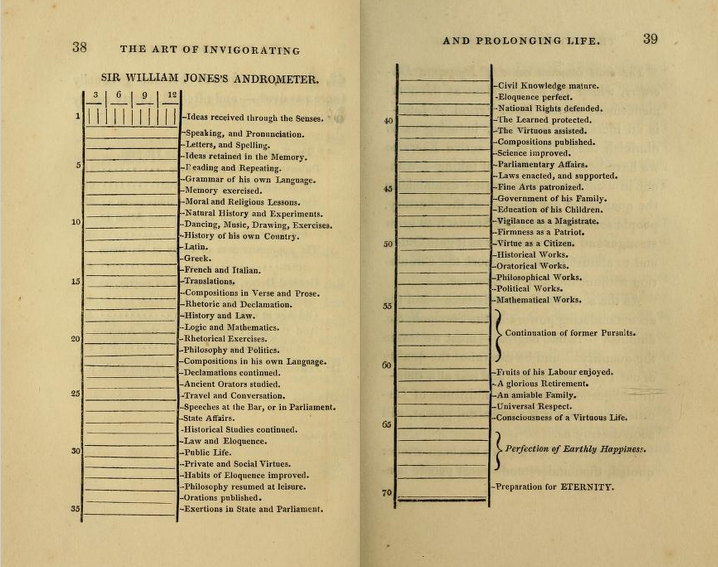 As well as detailed regimes (often involving drinking wine and taking siestas), there is included in its pages this view of life laid out by William Jones.